Daca pentru uciderea evreilor si a celorlalte etnii indezirabile pentru Hitler exista termenul de ”HOLOCAUST” (ardere totala), atunci pentru milioanele de nevinovati ucisi fara judecata autentica, din ordinele explicite ale antihristilor totalitari din interiorul si din afara tarii, ar trebui sa se gaseasca termenul de ”HOLOCRIERON” (inghetare de tot). Holocrieronul ar trebui serbat oficial si ar trebui sa i se dea CEL PUTIN aceeasi importanta ca si holocaustului. 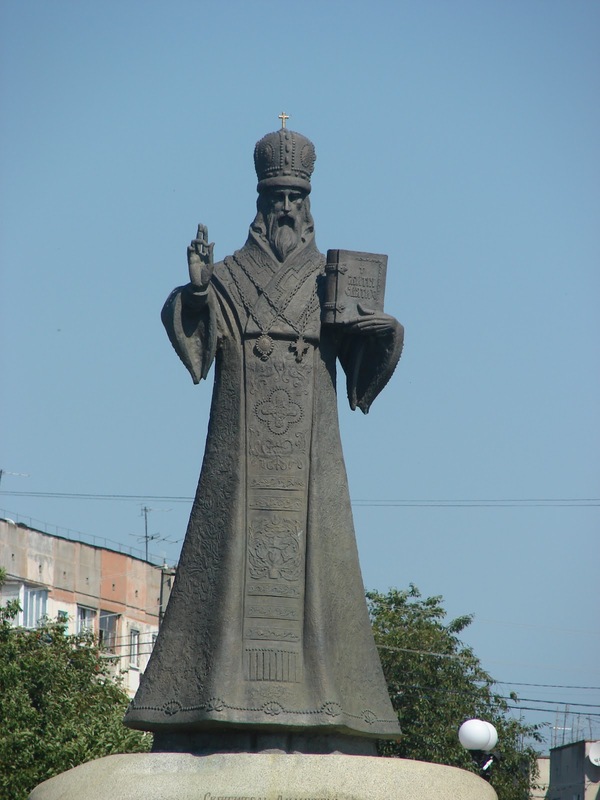 St. Dimitriy Tuptalo, Metropolitan of Rostov, was a Russian hierarch of the 17th century, a remarkable preacher, and religious writer, professor of theology and ascetic, but also miracle worker. Heis venerated today in the Russian Church but also in the entire Orthodox space. 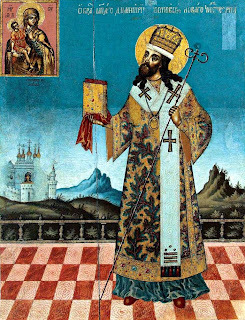 St. Dimitriy was born in 1651 in Makarovo, 40 km from Kiev, being baptized as Daniel. His father, Sava Grigorjevich Tuptalo (†January 5, 1703) was a soldier and often he was missing from home for a long time. Child's education was the particularly concern of the mother, Maria Michajlovna (†March 29, 1689), who gave him a Christian education. 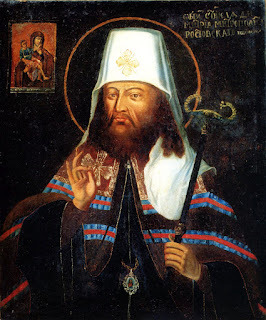 Soon the family moved to Kiev (1661), at that time located in Poland, and at the age of 11 years, Daniel entered the Orthodox Academy of Kiev (established by metropolitan Peter Movilă (Mogyla) some decades before), whose leader was at that time Innokenty Gizela (c. 1600-1683), a brilliant preacher and defender of Orthodoxy. Thanks to him, Daniel could develop during the study (1665-1665) a great charisma to explain the Scriptures and became sensitive to catechizing the faithful Church. A few years later (July 9, 1668, being 17) Daniel entered the Monastery of St. Cyril and received the monastic tonsure, named Dimitriy, after St Demetrius of Thessalonica. In addition to the usual ministries in monastery, which he performed with obedience, the young monk managed to complete the studies and to begin his missionary literary work. He was ordained a priest on May 23, 1675 at Holy Trinity Monastery in Gustyn, Prykuly district, and immediately was appointed by the Archbishop Lazar Baranov of Chernigov as preacher. Further, during this period went on pilgrimage to see different holy places in Belarus and Ukraine, at that time partly, in possession of the Greek Catholics. He was appointed in the next years as minister in several cities, as Chernigov (1675) and Slutsk (1677). In 1678, after a trip to Vilnius, he established in Baturyn, at the court of Hetman Ivan Samoylovych. His sermons were typical for the Baroque period, consisting namely in metaphors, allegories, rhetorical figures, questions and answers, especially on moral topics. Starting in 1680 the hieromonk Dimitriy lived mostly at Pecerska Lavra in Kiev, where he wrote many sermons, especially against the local mores, especially alcoholism and easier life. Soon it was given to him the leadership of several monasteries, always against his will, because his only desire was to live in asceticism and quietly. In this way he was abbot of Transfiguration Monastery of Maksakov, Borsna district (1681), and the following year to the monastery of St. Nicholas in Baturyn. Every time he tried to resign, but without succeed. His friends - including St. Theodosius, Archbishop of Chernigov (celebrated on 5 February) - managed to persuade him to remain abbot. This period of his life was devoted to theological writings, being concentrated upon the ambitious project of integrating all the lives of Russian saints into a single work, which he published as The lives of the saints between 1684-1705. His resources were the Greek Menologion of Saint Symeon Metaphrastes, the Menologies of Metropolitan Makarij (1482-1563), the Collections of Vitae of the Bollandists, the Annals of cardinal Baronius, and the Lives of the Saints of Piotr Skarga, which means both orthodox and catholic sources. His compositions, which he never pretended to be original, are until today very popular in the Slavic space. Together with his popular writing about the saints, he wrote also a Research on the fake faith of the schismatic (Rotsysk one cuz brynskoi raskolnitsei), a polemic work against the Raskolniks (Old Believers), the Russians who didn’t accept the liturgical reform of Patriarch Nikon form 1666. 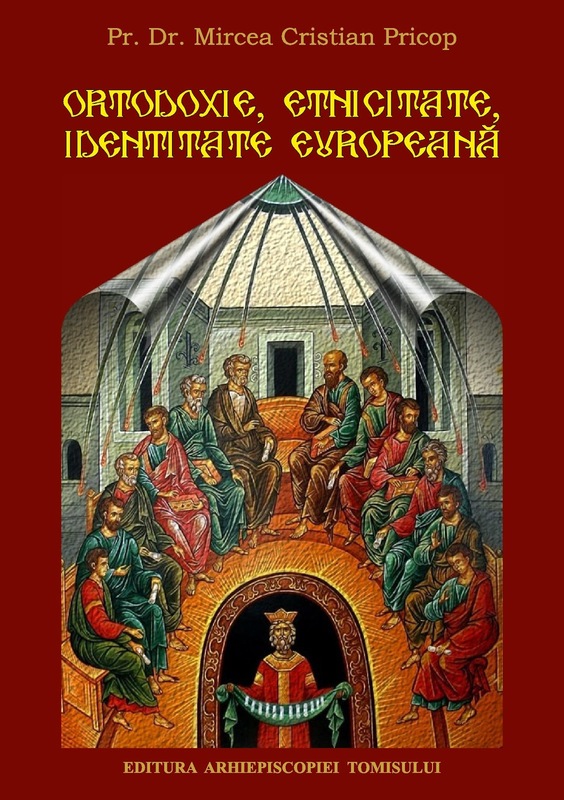 Dimitriy sees the error in the popular inculture and not directly in their faith. He also wrote a Catechetic Compendium. Also he found time to study the ecclesiastical history of the Russian Orthodox Church, so he wrote a Chronicle of the Lavra Pecerska, a Chronicle of the Russian tsars and patriarchs, a Catalogue of the Russian metropolitans, and also other works, especially homilies. 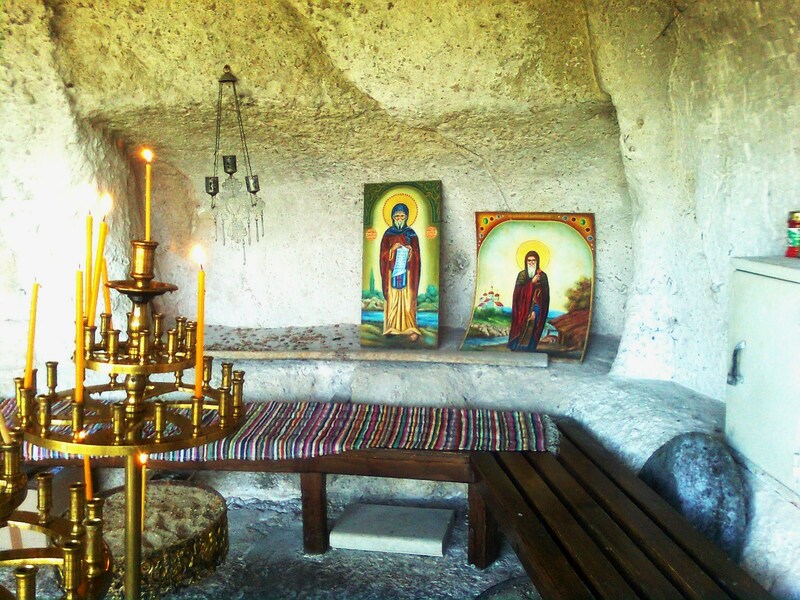 For 25 years, Saint Dimitriy devoted all the powers of such works, but besides the time spent to these, he was praying in church or alone. He was living in the company of the saints not only in writing but also in prayer, living their lives, suffering their torments with them and studying the smallest details in all the documents relating to them. In return for his love for the saints, God gave him often visions. 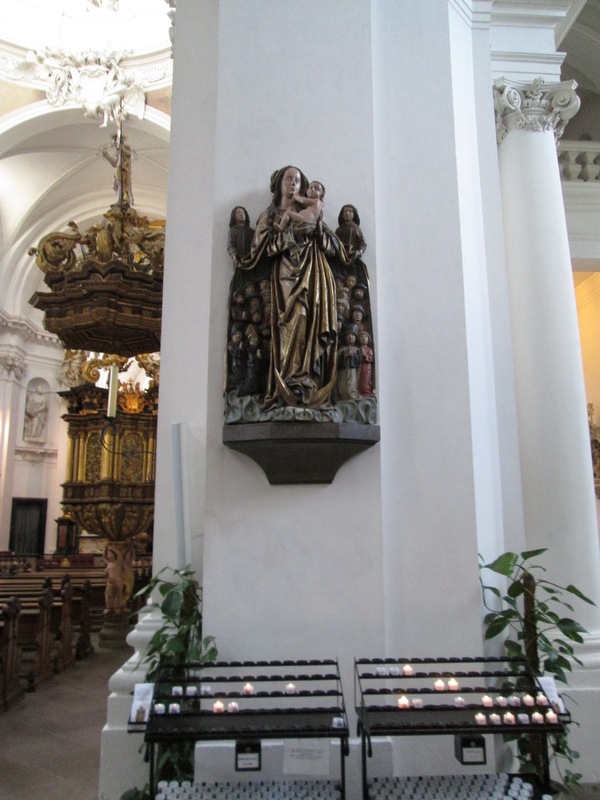 On August 10, 1685, he saw in a dream St. Great Martyr Barbara, notably honored by him. He asked her to intercede for him before the Lord, but she admonished him because praying "like the Roman Catholics", that means by meditating on the five wounds of our Lord. Indeed, the influence of Roman Catholic theology and spirituality was visible in the Russian Church in the cult. But after that St. Barbara smiled and comforted him. 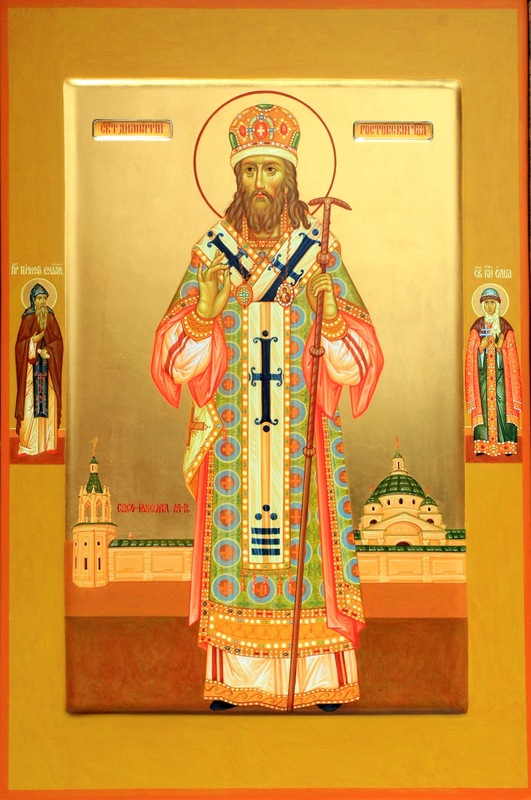 On November 10, the same year, Saint Orest appeared to him, the one of whom Dimitriy composed his life in the same day and he said: "I suffered more torment for Christ than those you remembered." Then he showed him a deep wound in the left side, saying: "Behold, this was done by a red hot iron". Then he stretched out his right arm and showed his veins that had been cut up to the elbow height and added: "Here, these were cut" Then showed him similar injury to his left arm, repeating the same words and then he showed that he had wounds on his knees, saying: "These have been cut". After that, he stood right and finally said, "You see, then, that I suffered more pain than you have remembered" St. Dimitriy asked St. Orest if he was one of the five Saints Martyrs whose feast is on December 13, but the martyr replied: "Not Orest of the five Holy Martyrs Church, but he who is honored today and whose life you just made it". 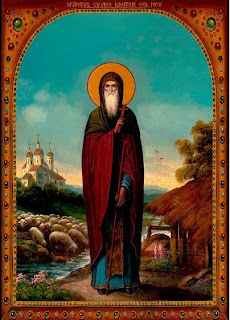 In 1694 Dimitriy was named abbot of the monastery of St. Peter and Paul in Hluchiv, in 1697 at the monastery of St. Cyril in Kiev and in 1699 he was named Archimandrite at the Transfiguration Monastery from Novhorod-Siverskyj. 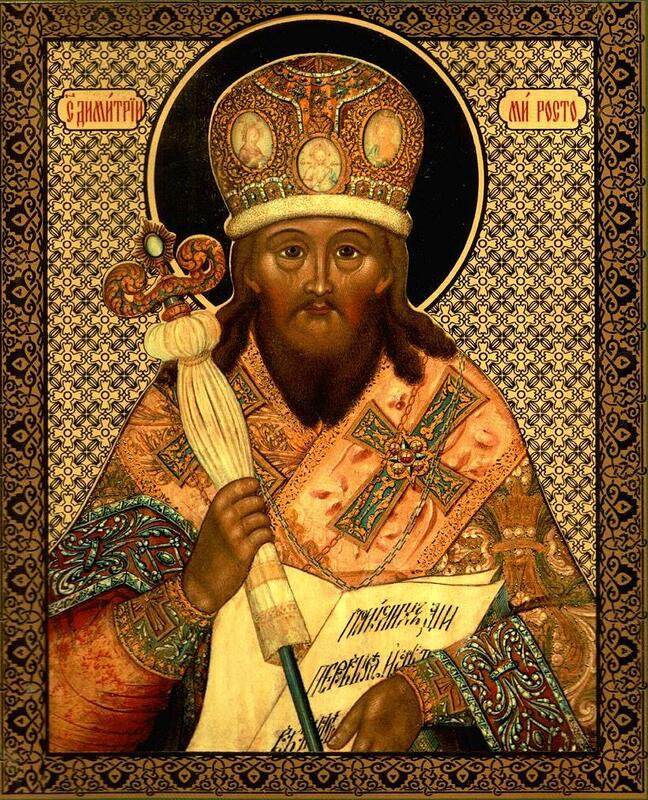 On March 23, 1701 Dimitriy was ordained a bishop in Moscow, being appointed metropolitan for Siberia and Tobolsk. His poor health and his need to have access to the texts necessary to continue the writing of the saints’ lives, made him to ask to be moved elsewhere. 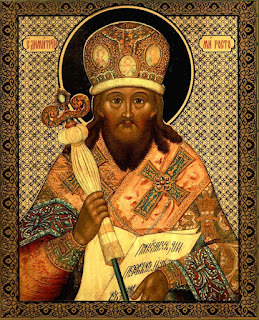 He was named in the Diocese of Rostov and Yaroslavl in January 4, 1702 and then he had a vision, in which it was discovered to him that he will have to find the eternal rest there in the monastery of St. James (Spaso-Yakovlevsky monastyr), in Rostov. During his life in Russia, Dimitry opposed both the Old Believers' and Peter the Great's ecclesiastical policies. He also made invaluable contributions to the Russian education, opening a school and a small theatre in Rostov, where his own plays could be staged. Dimitry was also active as a composer. 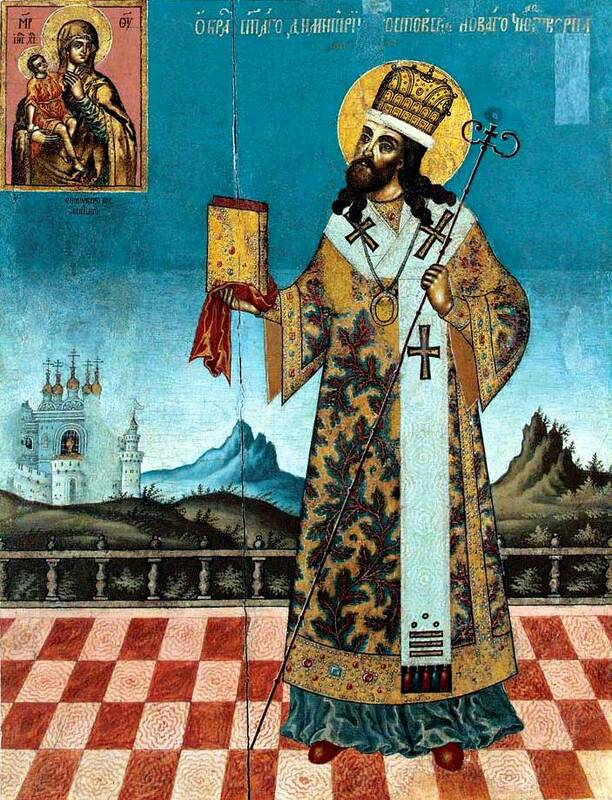 Many of his Penitential Psalms achieved a wide circulation, not only in the Ukraine but in the Balkans too, and many of them have become an integral part of Ukrainian folk-song tradition through the kobzari (itinerant blind singers). Dimitry is credited as composer or compiler of the first Russian opera of 6 hours, the Rostov Mysteries (1705). It is an oratorio on the lives of Russian saints, based on the "Cheti-Minei", published in four volumes in 1689, 1690, 1700 and 1705. The same source inspired Pushkin to write Boris Godunov in 1825. 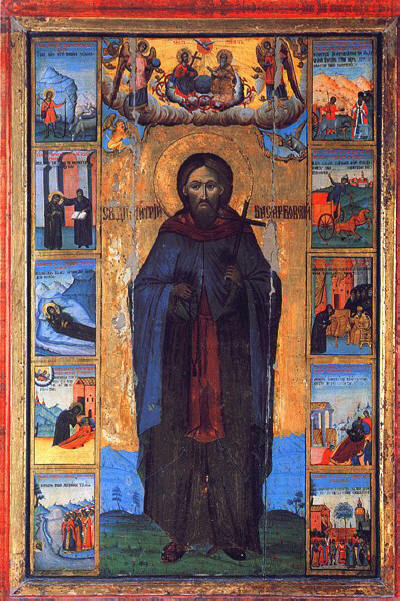 Shortly before his death, Saint Dimitriy completed his monumental work, the Lives of the saints (in 1705), and further took only the care for his community. He tried very hard to turn the religious life and manners of his contemporaries. Despite his frequent illnesses, he continued a strict canon in his life and never left his unceasing prayer. He also established a theological seminary near his home, where he has assumed much of the teaching. Saint Dimitriy has foreseen his death three days before. He bowed to the ground and asked for forgiveness from clergy and singers who served with him. After that, he closed himself in his cell, in a fervent prayer. The next day morning, October 28, 1709, he was found dead, kneeling at prayer. Contrary to the saint's wishes, which he expressed in his will, the clergy and people of Rostov asked the locum tenens of the patriarchal throne, Metropolitan Stephen Yavorsky of Ryazan, who had come for the funeral, to conduct the burial at the cathedral church of the city. Metropolitan Stephen insisted on burying the body of his deceased friend beside St Joasaph, who was St. Demetrius's predecessor. However, a grave was not prepared until the arrival of Metropolitan Stephen, even although about a month had elapsed since the saint's death. Due to the urgent departure of Metropolitan Stephen from Rostov, a hastily constructed wooden frame was placed into the grave, in which the body of the saint was buried on November 25. 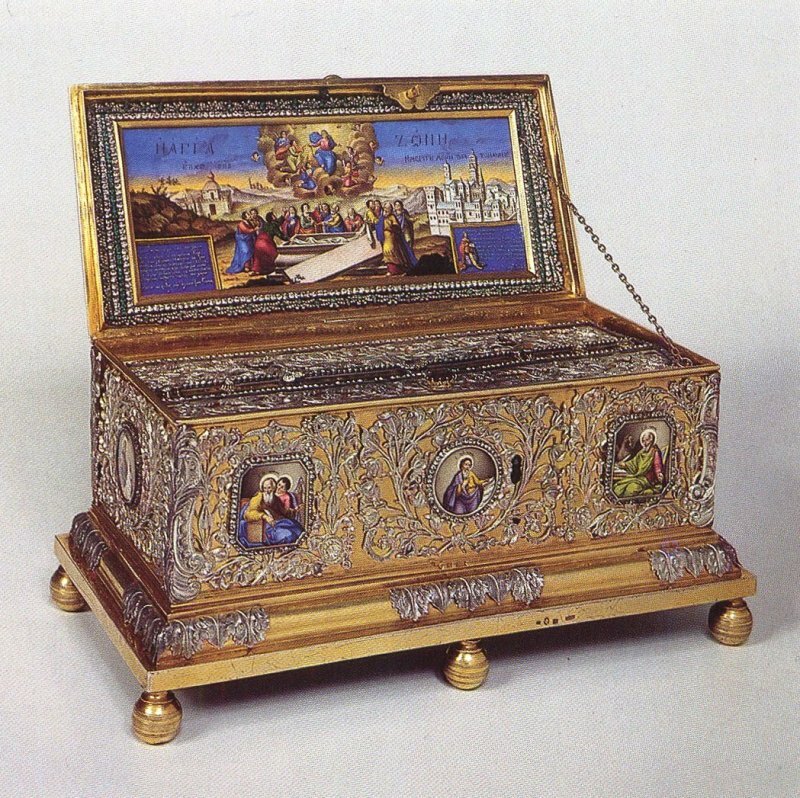 This circumstance, foreseen by the Providence of God, led to a quick uncovering of the relics. 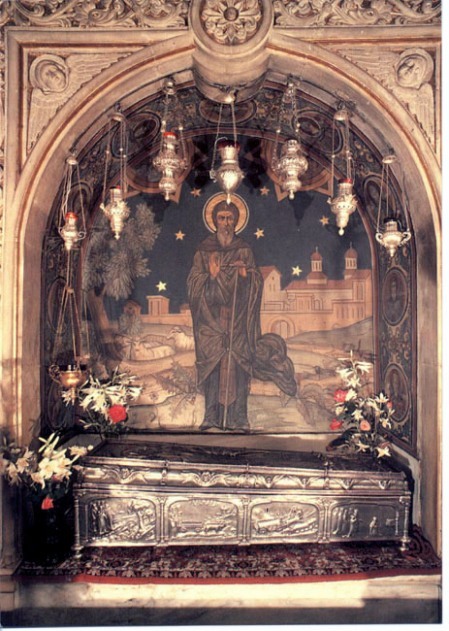 In 1752 repairs were being done at the cathedral church of the Trinity in the monastery, and on September 21, was discovered the incorrupt body of St Demetrius. The place of burial had been affected by dampness, the oaken coffin and the writing on it were decayed, but the body of the saint, and even the omophorion, sacchos, mitre and silken prayer rope were preserved undamaged. 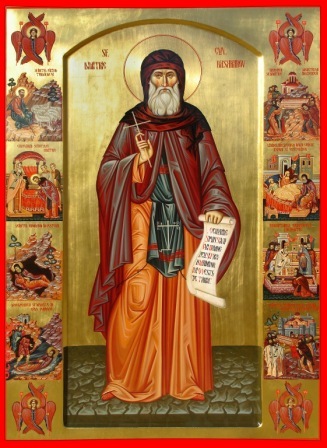 After the uncovering of the holy relics many healings were worked, which were reported to the Synod, by whose order Metropolitan Sylvester of Suzdal and Archimandrite Gabriel of Simonov arrived at Rostov to examine the relics of St Demetrius, and to investigate the incidents of miraculous healings. The Russian Church proceeded with the official recognition in April 22, 1757. His celebrating day is the day of his death, October 28, or November 10, according to the gregorian calendar. Also another celebration is on September 21, the finding of his miracle-working relics in 1752. 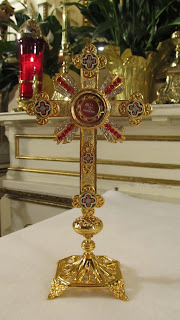 His relics are until today in the cathedral church of St. Jacob monastery on Rostov. A reliquary containing the right hand of St. Dimitriy is today in the St. Michael Church from the village Polovki, Chernigov region. Among the saints venerated in a special way in Romania, St Dimitrie the New of Basarabi (or, more correct, Basarabov), also known as „of Bucharest” has a special honour. He is the protector saint of Bucharest and all Wallachia. About the life of St. Dimitrie the New there are not so many data. The Romanian „Lives of Saints” mention that he was born in Basarabov, a village in Bulgaria, not far away of the city of Russe, on the Valley of Lom River. Probably his parents were simple Wallachian (Romanian) peasants, as it mentions also the Russian Orthodox Encyclopedia (Pravoslavnaja Encyklopedia) He lived in the 13th century, during the second Bulgarian Empire (1187-1396). The tradition mentions that he was very faithful since his childhood, fasting and praying strongly. According to a story, during his youth, as he went to graze the sheep of his family, he accidentally stepped on a nest of some birds and killed the baby birds. He considered that as a high murder, so he decided not to put a shoe or sock for three years – even on heat or frosty times - on his left foot, the one which killed the birds. As youth he entered a monastery near his village, and later he retired to a lonely life somewhere in the forests nearby. Finally he found as shelter a cave near the Lom River, where he lived the rest of his life. 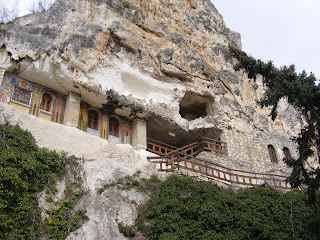 He foreknew the date of his death and he placed himself between two pillars of rock in that cave. So he gave peacefully his soul in God’s hands. 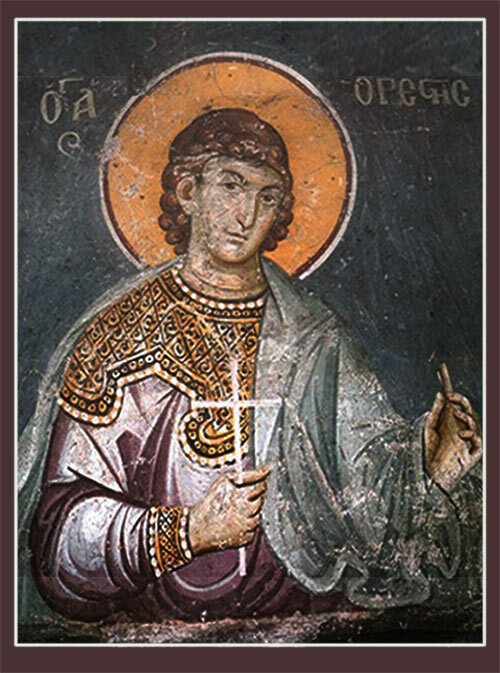 St. Dimitrie remained unknown and after a flood happened, the waters of Lom covered his body with deposits of stones and mud. After many years, a new flood of the river climbed up to the cave and the big current took the holy relics. They remained somewhere near the water and there were rumors that sometimes different people have seen in the night some flames – a phenomenon perceived in the Eastern Europe as a sign for a hidden treasure. Anyway the saint has shown himself to an epileptic young girl in her sleep, telling her about the place he was, and if he would be found, he will cure her. The young girl told to her parents about the dream and shortly a lot of people hearing about the dream went at the place indicated. Digging they have found the holy relics uncorrupted. 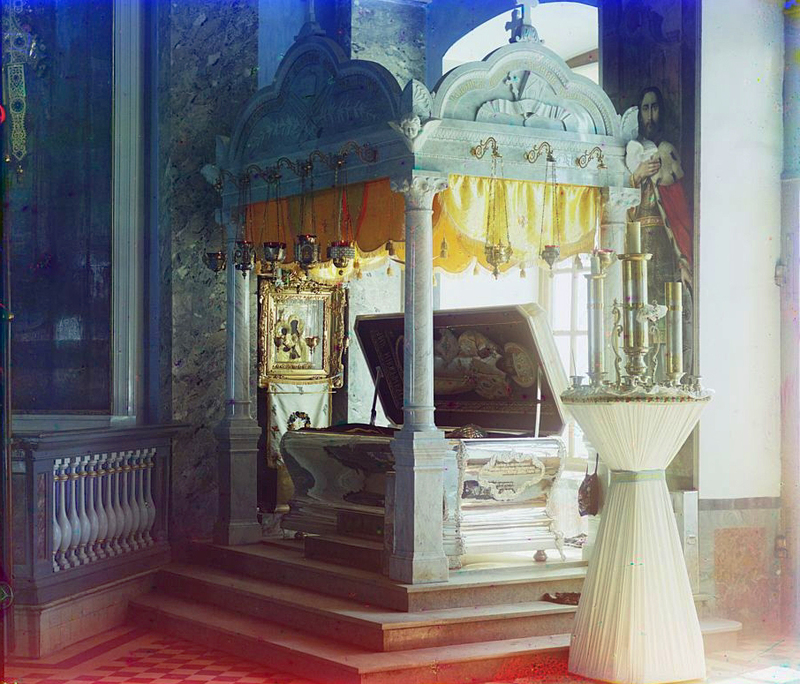 The girl was suddenly healthy and the sacred body of St. Dimitrie was put in a coffin in the church of Basarabov. Here happened some other miracles, as the story tells. 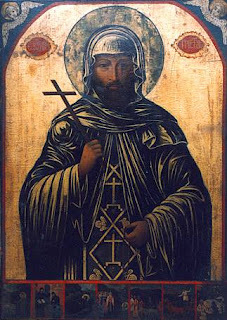 Another variant for St. Dimitrie’s biography was written by Paisius from Hilandar, a Bulgarian athonite monk (1722–1773) in his „Slav-Bulgarian History” (Istoriya Slavyanobolgarskaya, finished in 1762 in Zografu Monastery). The 9th chapter of this book is dedicated to the Bulgarian saints, and the 29th section is dedicated to Saint Dimitrie. According to this, he was a simple layman, who possessed several sheep and a small vineyard on the shore of the river, living in a hut between some rocks arranged by himself. He conducted in private life, and he died there, being buried. 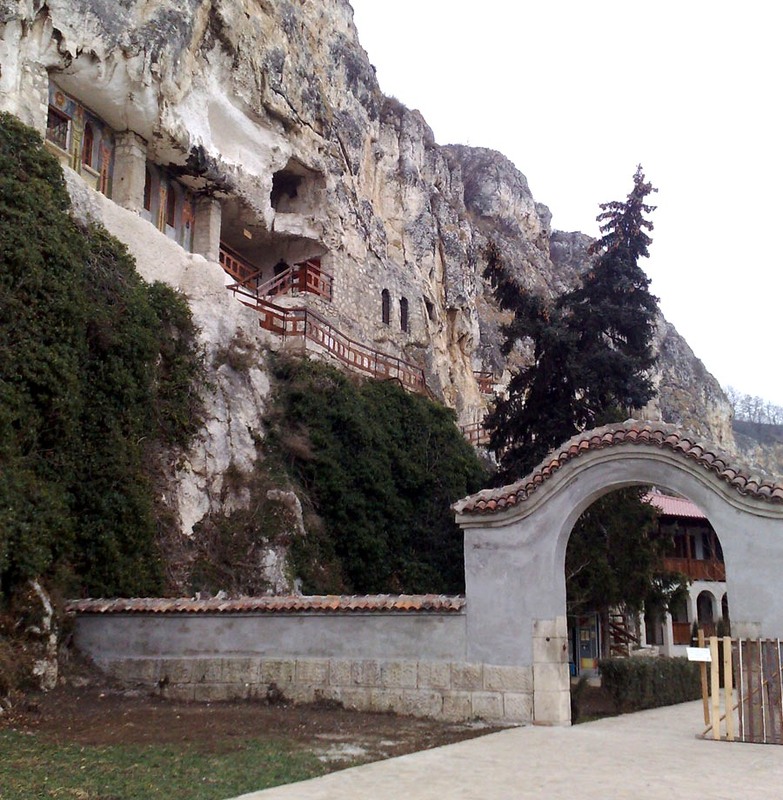 Paisius suggest that Saint died in 1685 and his relics were discovered later by some persons who transferred them in Basarabovo, near Svistov, in the Diocese of Tarnovo. 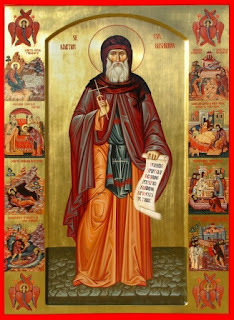 Paisius says also that St. Dimitrie made many miracles among the people. 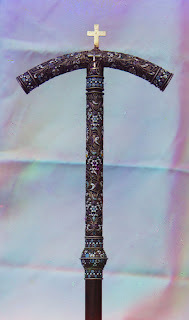 There is also a third legend, registered by the Russian Orthodox Encyclopedia. According to it, Saint Dimitrie was married but had no children. After his wife's death, he entered the monastery nearby and was tonsured a monk. Here he labored with great diligence, loving the vigils, fasting and prayer. Anticipating the hour of his death, he left the convent and went on the bank of the river, he laid down between two rocks, as in a tomb, and went the Lord. The story continues with the data from the first variant. The new thing brought in this variant is that St. Dimitrie was once married. 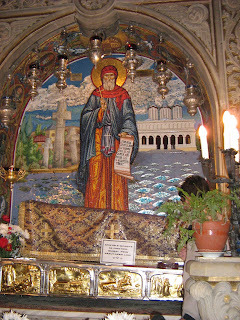 The Romanian Synaxarion, which reproduces the first story, reports a first attempt of taking the relics from Basarabov. One of the Wallachian Voivodes (without mentioning his name) tried that. He ordered to some noblemen to go there and carry the relics in a cart. Being already in the border town Ruse, the oxes yoked to the cart didn’t want to go further. After a while, the ones being there decided to let the holy relics in God’s hands. They yoked two young and untrained bulls and to let them by themselves. 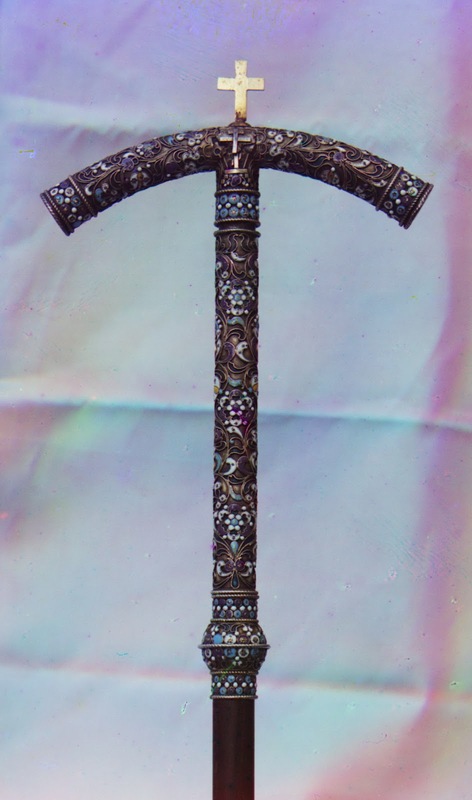 The bulls brought the holy relics in the middle of the village Basarabov and stopped there, this situation being interpreted as the will of God and of the saint, not to leave the homeland. 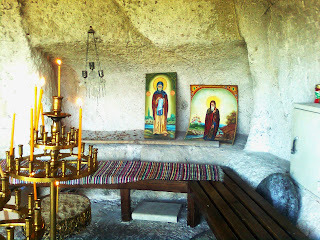 The relics remained in the village’s church until 1774. 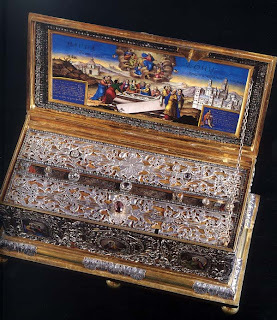 In this year, the Russian general Petr Saltykov, after a war with the Turks, decided to take the holy relics, in order not to be desecrated by these. 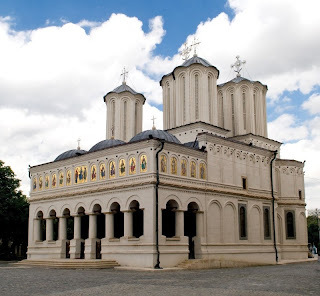 He intended to bring them to the kievan monastery Lavra Pecerska, but on the way, in Bucharest, the merchant Hagi Dimitrie, a macedo-Romanian (Vlach from Macedonia) convinced them to let the Saint in Wallachia, as a consolation brought to the people who suffered after the war. The general let himself convinced and took with him a hand of the saint, which is now in Lavra Pecerska. 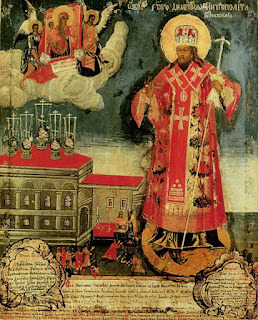 The rest of the holy relics rested since then in the metropolitan cathedral (since July 13, 1774) during the Russian occupation (1769-1774), being received by the metropolitan Gregory II of Wallachia (1760/1787). The chronicles interpreted like a miracle of St. Dimitrie the fact that the war and the plague happened then ended suddenly. 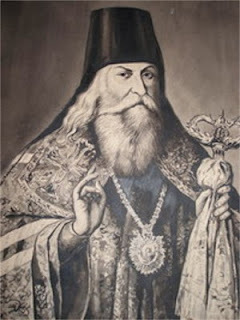 Since 1792 metropolitan Filaret II (1792-1793) proclaimed St. Dimitrie Basarabov as the patron saint of Bucharest. Among the miracles, there are some stories about people trying to take fragments of the holy relics. First of one happened since the saint was still in Bulgaria. 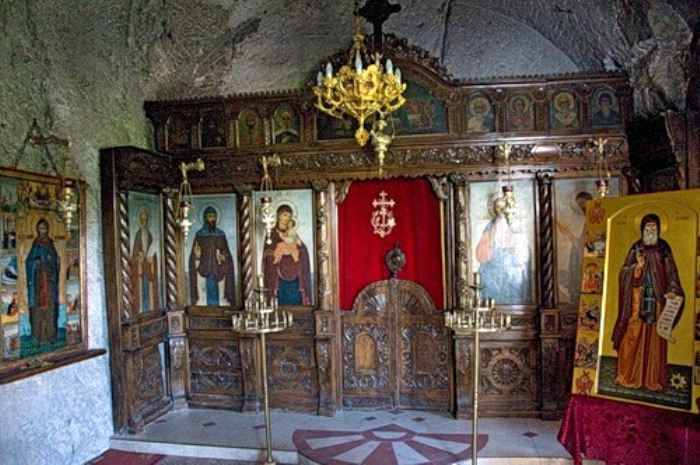 During a pilgrimage, a deacon of the metropolitan Nikifor of Tarnovo tried to take a small piece by biting them, but he remained paralyzed there and couldn’t move until he confessed his deed. The same happened with two women from Cernavoda, Aspra and Catherine who managed to build a church in honor of the Dormition of the Virgin in their town. They wanted a small piece of the relics in their church, but even if they managed somehow to „steal” a small piece, the oxes yoked at her cart did not want to go until they have put back the piece and confessed their sin. In the same period the bishop Ioanikij of Preslav was very sick and carried by his people on a stretcher to the holy relics. After the audition of the Holy Liturgy in the church, he managed to wake alone and walk by himself and praised the Lord. 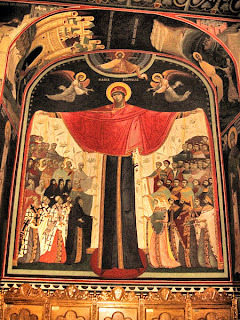 In Bucharest, Saint Dimitrie is celebrated for other miracles. 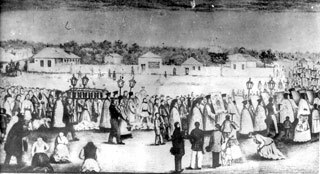 In 1815 there was another epidemic of plague and the Prince Ioan Gheorghe Caragea (1812-1818) ordained a procession with the holy relics on the streets. The plague stopped suddenly. The same happened during the big drought in 1827 and during the cholera in 1831. Another chronic disease was an angina occurred because of the swamps near the capital, started on May 1st 1870. General Dimitrie Papazoglu who wrote a history of Bucharest noted that on this occasion the procession with the holy relics started from the cathedral, led by hieromonk Ieronim and went all the town up to the „Foişor” church. After a day and a night, as much as the relics remained in this church, the mosquito clouds dissapeared and the sick people were healthy again. There is also a lithography which depicts this event, painted by G. Venrich, dedicated to the hieromonk Ieronim. 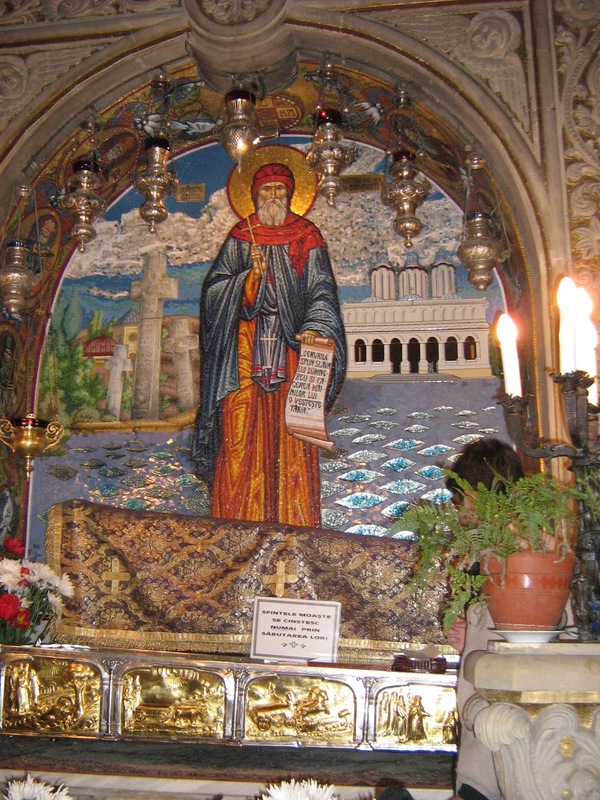 The pilgrimages as the coffin of St. Dimitrie occurred every year on October 27, the celebrating date, which was just the second day after the celebration of the most known Demetrios of Thessaloniki. During the communist times the pilgrimages were forbidden. 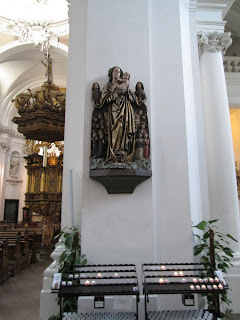 But even in this difficult period there were people to came and venerate the saint. A more recent miracle was recorded by Iustin Bulimar, a hieromonk who still serves at the Cathedral. 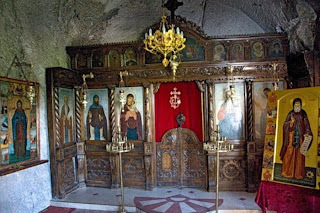 He said in an interview that: „In 1989, after a service of the Holy Unction, I observed a believer that I saw many times participating in this Holy Sacrament and to the other services of the Church, who used to remain always the last in worshipping [of st. Dimitrie]. And in one day, doing as usual, he climbed to the coffin of the relics - but why was he always the last to worship? - Because he was walking with crutches - he let away his crutches, as usual, in order to can take them after prayer [my notation: the place is very narrow and anyone can walk there just leaning on therailings]. After falling to its knees, as he could make in his own way there, the miracle happened: he rose, bowed, and went down the stairs. He didn’t realize at the moment that he actually forgot his crutches and only after going down from the Patriarchat Hill [the cathedral is located on a hill] he realized the miracle happened. He turned back crying and thanking to God and to St. Dimitrie in tears”. The latter patriarch Teoctist of Romania declared that it may be the help of the saint who didn’t allow to the communists to destroy the cathedral, as they planned, in the ’80s. Even venerated since centuries and proclaimed as the patron saint of Bucharest in 1792, St. Dimitrie was officially canonized only after a synodal decision in 1955, during the Patriarch Justinian Marina. 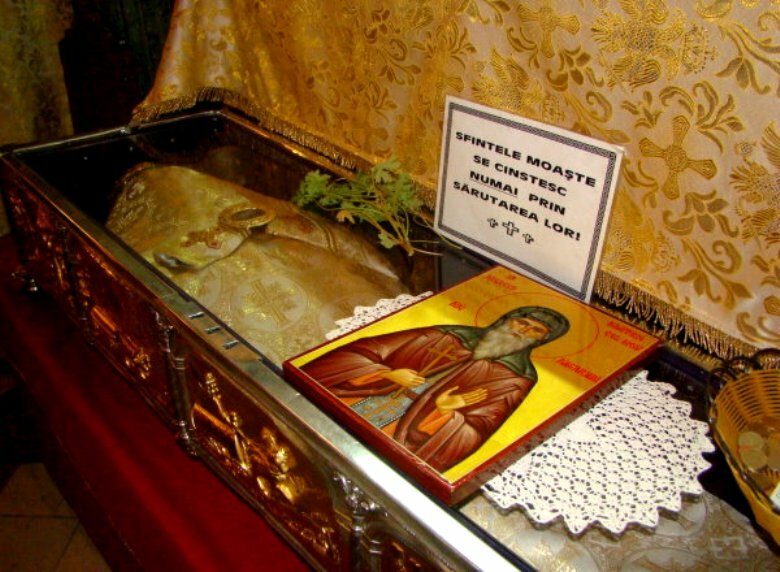 As a gesture of brotherly love, on October 27, 2005, Patriarch Teoctist of Romania gave at the request of Patriarch Maxim of Bulgaria an icon containing a particle of the saint’s relics, which is to be found today in the monastery of St. Dimitrie in Basarabov, located at 8-9 km from Ruse, a town on the Danube. 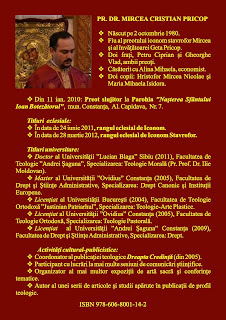 Cartea Părintelui Doctor Mircea Cristian Pricop, „ORTODOXIE, ETNICITATE, IDENTITATE EUROPEANĂ”, a cărei publicare o binecuvântăm cu bucurie, abordează un subiect de actualitate pentru teologia ortodoxă, implicând conexiuni profunde cu mai multe discipline științifice. 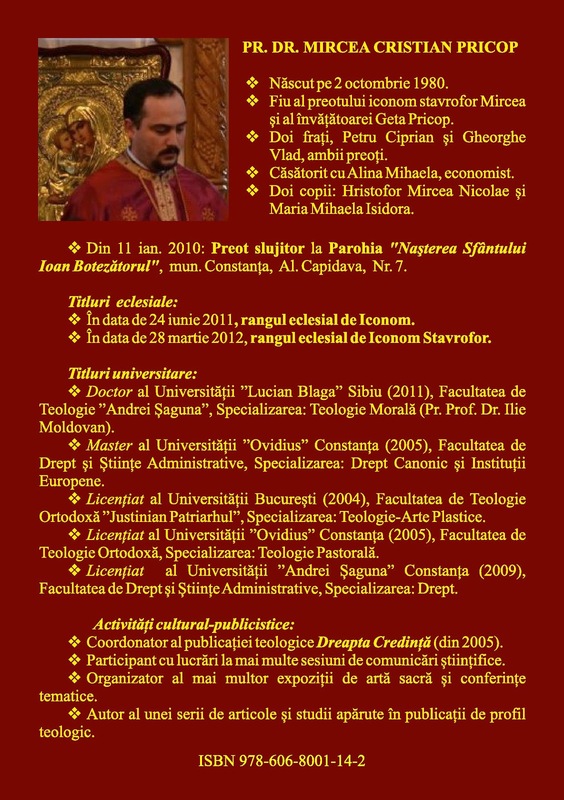 Ea își propune în principal evidențierea și studierea binomului: neam românesc/Biserică Ortodoxă, în contextul social și mai ales religios al unei Europe postmoderne frământate de condiția sine qua non a propriei supraviețuiri: redobândirea unui ”suflet”. (…)Prin amploarea investigaţiilor, prin complexitatea temei, prin pluridisciplinaritate, precum şi prin implicaţiile practice pe care le sugerează, lucrarea reprezintă o importantă contribuţie în domeniul Teologiei Sistematice, o teză meritorie şi o mult așteptată premieră în teologia românească, pentru care merită felicitări. De aceea o recomand călduros tuturor slujitorilor și credincioșilor Bisericii străbune, doctoranzilor, masteranzilor și studenților din ţară și din străinătate, pentru ca, prin amploarea răspândirii ideilor sale, să-și capete locul cuvenit în opera de regenerare spirituală a neamului românesc și a conștiinței creștine europene, pe care s-ar putea fundamenta cândva o autentică identitate comună. Temelia pe care autorul o așează cu semnificația ei absolută prin valorificarea Cincizecimii în Biserica Creștină, deschide o perspectivă prin care se iluminează cuprinsul întregii lucrări și în același timp justifică aserțiunea potrivit căreia creștinismul românesc deține cheia împlinirii unor imperative, de asemenea absolute, care să aducă împreună cu ele rezolvarea celor mai urgente soluții privind destinul Europei contemporane. (…) Autorul ajunge să identifice ”principiul etnic și cel teritorial al neamului” drept ”fundament al unității Bisericii”, fiind vorba despre precizarea în context a unor idei care împărtășesc acestei teze doctorale un spor de originalitate în rândul tezelor de până acum, dar mai ales îi oferă șansa perceperii actualității cu care abordează o tematică teologică cu care se impune în literatura de specialitate. Among the eastern Feasts dedicated to the Holy Mother of God there is possible to make a distinction between the ones involving the activity of the Holy Virgin during her earthly life and her further activity among the Christian believers. In the first category we may number the event of her birth, the Presentation at the Temple, the Annunciation and the Nativity of Our Lord and, of course, the Dormition of the Holy Virgin. In the second category they may be numbered a number of miraculous apparitions of her, many miraculous healings, even a resurrection from the dead, miracles who are remembered in some hymns dedicated to her, as the Akathist Hymn and the Paraklis to the Mother of God. The most impressive Orthodox feast in the honor of Virgin Mary from this second category is undoubtedly the Protection of the Theotokos, celebrated on the October 1st, and additionally on October 28 in the Greek Churches. Better known as the “Pokrov” in the Slavic countries, “Acoperamantul Maicii Domnului” in Romania or “Skepi” in Greece and Orient, the Feast is about a miraculous apparition of the Holy Mother of God in the byzantine church of Blachernae, but also in connection with a holy relic known as the Veil of our Lady. Furthermore, the Greek word of Skepi means both “protection” and “veil”. The feast of the Protection is celebrated in connection with the extraordinary life of a fool-for-Christ, namely St. Andrew from Constantinople, celebrated in the very next day (October 2) after this feast. 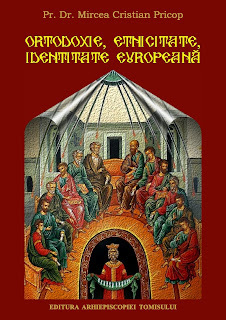 As his biographer, the priest Epihanius from the Agia Sophia Cathedral, noted, St. Andrew had a Slavic ancestry and was a slave at the court of a nobleman in Constantinople. In one night he received a divine commandment to act like a fool in oder to accomplish a special mission. St. Andrew used from this moment to live on the streets or under the roofs of the churches, together with the beggars, homeless and prostitutes, making at the first sight only silly things, but in reality having to bring back to the faith many sinners. After some time living like a fool, Andrew becomes friend with Epiphanius, to whom he confesses his real identity, the meaning of his actions and also his visions, teaching him the real Christian way of living. The celebrating of the Protection of the Theotokos in this day has as its reason more than this isolated event. There may be said that it is connected moreover with several miraculous savings of the city of Constantinople, endangered by some different foreign invasions. For the first time the capital of the Byzantine Empire was sieged by the Persians and Scythians in 626, during the reign of Heraclius. After a procession with the icons and with a relic of the Virgin Mary (probably the veil, because her robe, and part of her belt that had been transferred from Palestine by the order of Leo I in 473), a sudden storm dispersed the fleet of the enemy in the Golden Horn, near the Church in Blachernae and Constantinople was saved. In the honor of the event, patriarch Sergius (or, after some others, the deacon George Pisida) composed the famous Akathist Hymn. The Arabs sieged the City in 717-718 but they lost the battle in a similar manner, and later the Rus’ people, the ancestors of the Russians, leaded by Askold and Dir in 860, after the Primary Chronicle. The Patriarch Photius and Emperor Michael leaded then an all-night vigil in the Church of Our Lady of the Blachernae. The chronicler says that “the weather was still, and the sea was calm, but a storm of wind came up, and when great waves straightway rose, confusing the boats of the godless Rus, it threw them upon the shore and broke them up, so that few escaped such destruction and returned to their native land”. According to Nestor, the feast of the Protection celebrates the destruction of this fleet sometime in the 9th century, which cannot be correct, since St. Andrew lived at the beginning of the 10th century. Anyway, according the Russian tradition there is clearly believed that the barbaric people who surrounded Constantinople in the times of St. Andrew were even the kievan Rus’. The historical facts state that in 907 the Byzantine capital was attacked by the troops of Oleg of Novgorod, who wanted special trading rights of his people with the empire. Leo fought back and the city was spared, but they attacked once more in 911, and then the treaty was signed. October the 1st was Saturday in 907, so that the information could be certified. Finally the protection of the Theotokos to Constantinople is connected to a potential Bulgarian invasion in 926, when the Tsar Simeon was convinced not to attack the city, after showing to him the Holy Veil. There is interesting to note that the Holiday of the Protection started to be celebrated in the 12th century among the Russians, people who attacked at that time the Constantinople. The celebration spread out in the whole Eastern Christianity, but until today its importance remains special in the Slavic speaking Orthodox countries. The Protecting Veil seems to be an “omophorion”, similar to a neckcloth. Its form is also certified by its depiction in the icons. The Orthodox bishops wear an “omophorion” as the symbol of the fullness of hierarchic power. 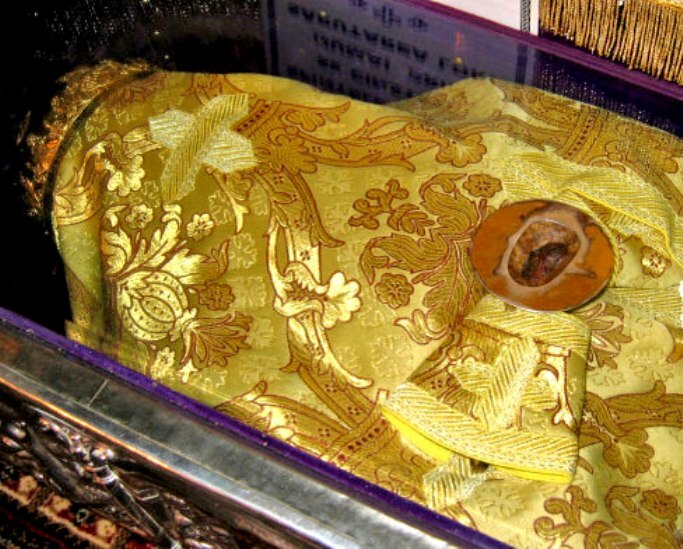 The Veil of Theotokos, together with her belt and other sacred relics were brought from Palestine by the order of Emperor Leo I the Thracian (457-474) and remained since 473 in the Church of Blachernae, being popular by several miracles occurred in connection with it. A part of the Protecting Veil or maybe the whole of it was given by the Byzantine Empress Irene as a gift to the Western Emperor Charles the Great, as part of a wedding negotiation. Charles donated it to the Chartres Cathedral, where it remained until today, though some small pieces of it were spread all over the West. As an example, such of a piece is kept today in the church of St. Josaphat from Detroit, USA.The Veil continued to play a role in Byzantine history, even if rather in the ritual cult than in a physical veneration. In the East, the veneration of Theotokos is connected also with the “Belt of Theotokos”, today kept into a small box in the monastery of Vatopedi (Mt. Athos) is made from camel hair. According to the tradition, the middle of it was sewing with gold thread by the emperess Zoe of Constantinople, who received healing from the holy belt. Going back, the tradition states that this belt was given in a miraculous way to St. Thomas the Apostle, who came too late to the funeral of the Holy Mother, as a sign of her ascension to heavens. First the belt remained in the Jerusalem. The Emperor Arcadius (395-408) is the one who has taken it to Constantinople, first at the Church of the Holy Apostles, and later to Blachernae (during the reign of Emperess Pulcheria, 450-453), and it has remained here together with other relics (as told before), until the age of Justinian, when it was moved to the Hafia Sophia. As told before, Emperess Zoe, being cured by bearing this belt, have sewed it with a gold thread, and put it again in the reliquary. This event is marked in the Orthodox calendar, with the Feast of putting the Belt in the reliquary (on August 31st). Finally it was taken from here by the Bulgarians of Ionita Caloian, after a battle lost by Alexios Angelos III (1195-1203) and finally it arrived at the monastery of Vatopedi, being given by Lazar, the tsar of the Serbs in 1389. After that, the holy Belt was taken in longer processions during some great epidemic diseases, such as the pest in Wallachia (1813) and in the Ottoman Empire (1871), or in the modern times, in different countries, just in order to be venerated. 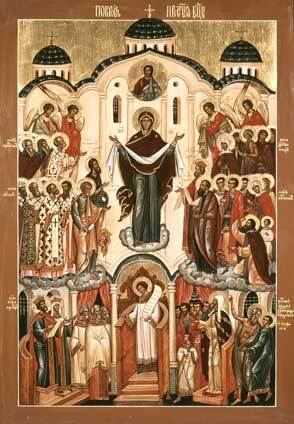 The icon of the feast depicts the Holy Virgin standing above the faithful with her arms outstretched in prayer and draped with a veil, being surrounded by the angels and also by the twelve apostles, bishops, holy women, monks and martyrs, standing under the veil. She holds in her outstreched arms the holy veil, which symbolizes the protection of her intercession. Under this scene, which reminds about the heavenly Church, there is the earthly church, probably Blachernae, where there is depicted a young man clothed as deacon, who bear in his left hand a scroll with the text of the Kontakion of the Nativity, which text honors the Mother of God (“Today, the Virgin gives birth to the One who is beyond the Being…”). 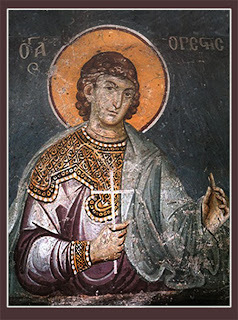 This is St. Roman the Melodist, a hymnographer also celebrated on October 1st. Even he is not directly connected to this feast, his story tells about the fact that he receive the charisma of writing melodies in the honor of the saints, after the Holy Mother told him in a dream to eat a scroll that she was giving to him. Doing that, he started to be inspired to write. Together with him, on the right there are Andrew and Epiphanius, and in the left there are also depicted the Emperor Leon the Wise with his emperess Zoe (who has miraculously cured from a disease – probably epilepsy - by bearing the Belt of the Theotokos) and the Patriarch of Constantinople at that time, which is probably Euthymius I (enthroned in march 907). The Pokrov icon may well be related to the Western Virgin of Mercy image, in which the Virgin spreads wide her cloak to cover and protect a group of kneeling supplicants. This is first known from Italy at about 1280. One of these scenes is depicted in the Dome of St. Bonifacius in Fulda, Germany.